← How Healthy is Your Kid? Quiche is a really versatile and hearty breakfast dish, which you can pack full of lots of vegetables. We can skip the crust and egg yolks to shave off some calories and lower the amount of fat too! My favorite version is made with broccoli and cheese, so you’ll have a filling breakfast with protein, folate, vitamin c, and calcium. It’s a great idea to make this in advance, so you can reheat a piece in the morning. It can even be frozen in smaller batches. Sauté the onion and garlic in the olive oil for 2 minutes. Use a skillet and medium-high heat. Add the broccoli and sauté for another minute. Coat a 9 inch pie pan in cooking spray. Spread the sautéed mixture on the bottom of the pan. Combine the rest of the ingredients, besides the parmesan cheese. Pour the milk and egg mixture into the pan. Sprinkle the parmesan on top. Bake the quiche for 40 minutes, and let it stand for 5 to 10 minutes before serving. 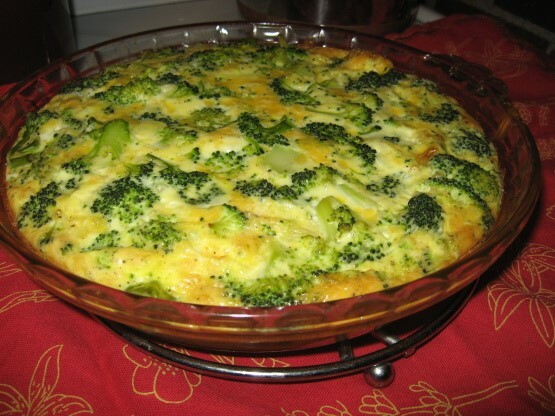 This entry was posted in Cooking, Eggs, Food, Health Tips, Healthy Eating and tagged broccoli, eggs, Healthy, Quiche, Recipe. Bookmark the permalink.